Note: The term "Distress" refers to the constitutionally required date that the case must be decided. "MFR Distress" refers to the constitutionally required date that all motions for reconsideration must be decided. Once a case is docketed to a specific term, the Georgia Constitution requires the Court to decide the case before the end of the next term of court. Cases docketed to the Winter/December 2023 Term (begins Dec 5, 2022) must be decided by June 30, 2023. Cases docketed to the April 2023 Term must be decided by November 3, 2023. Cases docketed to the August 2023 Term must be decided by March 15, 2024. Note: Distress Date For Cases Docketed to the August 2022 Term is March 16, 2023. MFR Distress is March 31, 2023. Distress Date For Cases Docketed to the Dec/Winter 2023 Term is June 30, 2023 (July 2 is Sunday). MFR Distress is July 17, 2023. Distress Date For Cases Docketed to the April Term is November 3, 2023. MFR Distress is November 17, 2023 (November 18 is Saturday). 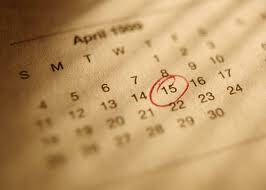 Distress Date For Cases Docketed to the August Term is March 15, 2024 (March 16 is Saturday). MFR Distress is March 29, 2024 (March 31 is Sunday).